Why take your instructor development course with Nautilus Aquatics? With our team of IDC Staff Instructors and our full-time Course Director, Nautilus Aquatics helps you develop stronger demonstration quality skills to become a more competent dive professional. All classroom and pool work is the Northern Virginia area. To ensure minimal disruption to your regular schedule, travel is only required for the final portion of the course. Open Water Training Presentations and Rescue Evaluations are completed in West Palm, Florida or in Puerto Aventuras, Mexico. No cold dark quarries! If you like people, have a passion for scuba diving, and want an extraordinary life, then you should become a PADI Instructor! Teaching scuba diving allows you to share your love of the aquatic world with others while doing what you enjoy – being in, around, and under water. PADI Open Water Scuba Instructors and PADI Assistant Instructors are the most sought-after dive professionals in the world. This is because they’ve completed the program that sets the standard for training dive professionals. You earn a PADI Instructor rating through hard work and commitment, but you’re rewarded with a job that lets you share incredible underwater adventures with others, transforming their lives for the better and enriching your own. If you are ready to join the ranks of the dedicated professionals who teach the world’s most progressive and popular scuba diver education programs, then Go PROSM with an Instructor Development Course. 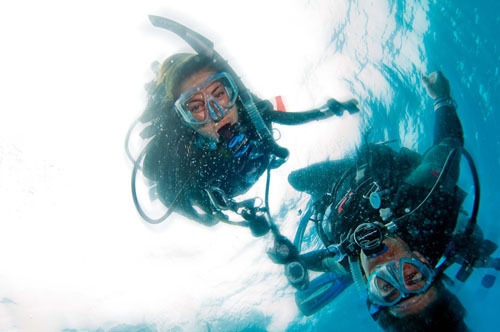 The Instructor Development Course (IDC) is made up of two parts: The Assistant Instructor (AI) course and the Open Water Scuba Instructor (OWSI) program. Most dive professionals complete the entire IDC and go on to attend an Instructor Examination (IE), which is the final step to earn a PADI Instructor certification.